See: A 31-foot-long Yangchuanosaurus dinosaur skeleton stands in the central atrium, a few steps from the security station. It’s on loan from the Fernbank Museum of Natural History. Eat: One Flew South serves much-buzzed-about “Southernational” cuisine, from shrimp and grits to pulled duck sandwiches to kamikaze rolls (Concourse E). If you’re craving fast comfort food, though, try The Varsity, an outpost of the famed local institution dating from 1928 and serving chili cheese dogs and Frosted Oranges (Terminal F). Shower: The Club at ATL provides showers, TVs, Wi-Fi, work stations, food, and drinks for $35 for a day pass (Terminal F). 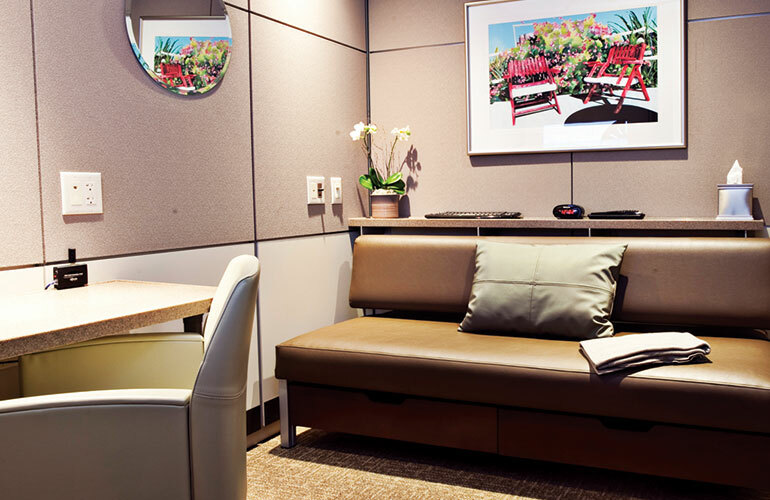 Sleep: Minute Suites offer five private, noise-neutralized rooms where you can nap for $34/hour (Concourse B, near Gate B16). 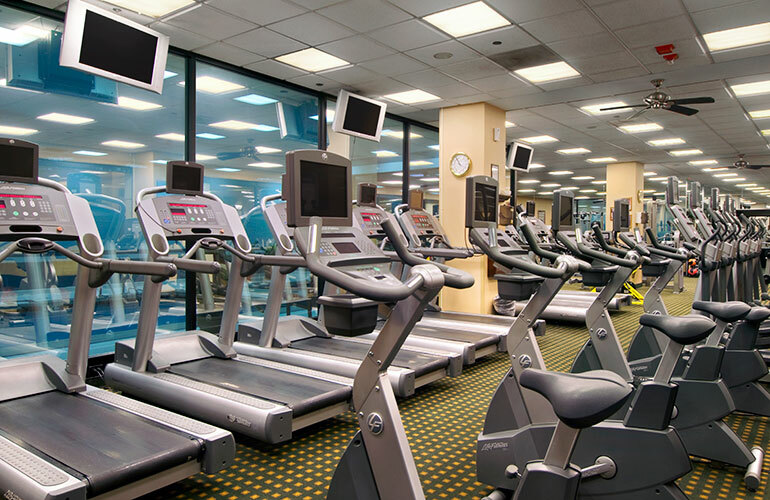 Exercise: The O’Hare Hilton sells day passes to its health club (with an indoor pool reopening August 15) for $20 (Terminal 1). Relax: Three Terminal Getaway Spa locations offer a menu of massages, from 10 to 90 minutes long (Terminal 3, near Gate H1; Terminal 1, near Gate B12; H/K Corridor, near the American Airlines Admirals Club). 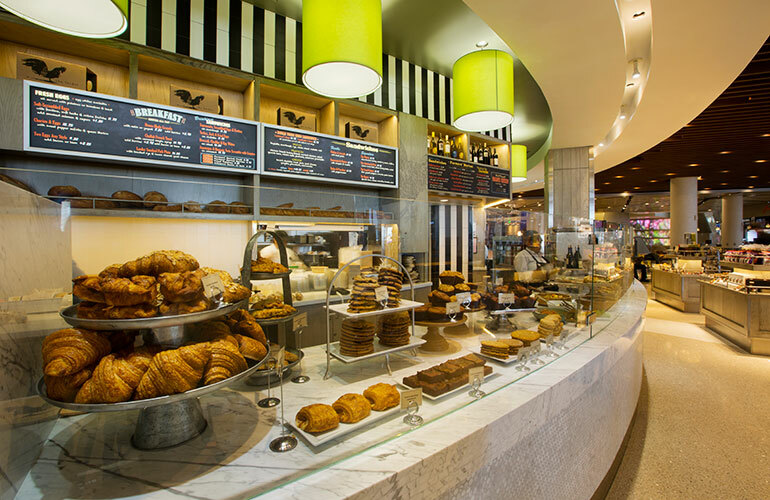 Eat: There are three outposts of local celebrity chef Rick Bayless’s Tortas Frontera, where you can order up hand-crafted tortas and fresh guacamole made from top-quality ingredients from nearby farms (Terminal 1, near Gate B11; Terminal 3, near Gate K4; Terminal 5, near Gate M12). Play: Kids on the Fly is a huge children’s-museum-slash-playground where parents can accomplish their pre-flight mission: exhausting their offspring (Terminal 2). Drink: Grab a Fig Fizz or an Isaac’s Apple in Grand Hyatt DFW’s Grand Met Lounge cocktail bar, home also to the airport’s only sushi bar. See: Founders’ Plaza has telescopes and an Observation Area where you can watch aircraft take off and land. 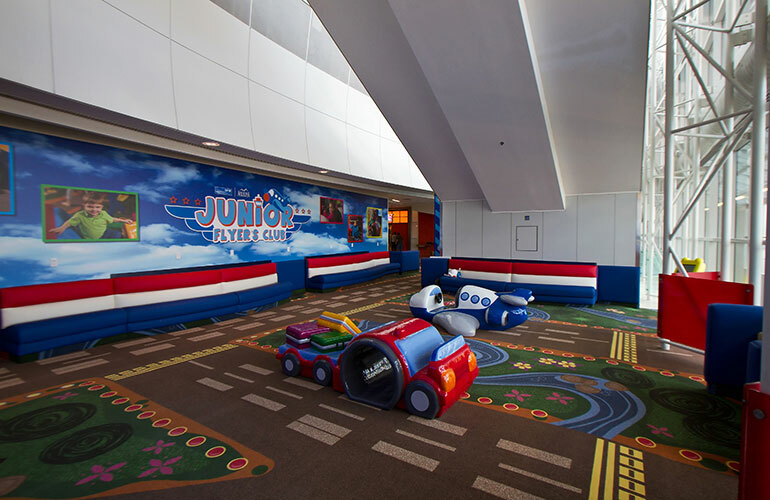 Play: Run your toddlers in one of three Junior Flyers Club playgrounds (the largest is in Terminal B at Gate 12). Relax: The Centurion Lounge offers showers, food, drinks, Wi-Fi, and a family room to American Express cardholders for $50/day and to AmEx Platinum cardholders for free (Concourse D opposite Gate D17). Golf (yes, golf): The Bear Creek Golf Club is adjacent to the airport, just a five-minute cab ride away. Tee times are open to the public; you can even book online. Eat: Denver chef Justin Cucci’s popular field-to-fork restaurant Root Down has an outpost at DIA (C Gates). Don’t have that kind of time? Grab handmade potato chips at Randy Petersen’s favorite DIA hangout, Lefty’s (B Gates, Near Gate B48). Marvel: The pedestrian bridge that connects the terminal with the concourse passes right over the tops of planes as they taxi. Look down and be awed by the giant flying machines. Detoxify: Choose from a range of massages and treatments, starting at just 15 minutes long, at XpresSpa (Concourse C, Center Core). See: The Howard W. Cannon Aviation Museum depicts a slice of aviation history (Level 2, above baggage claim). 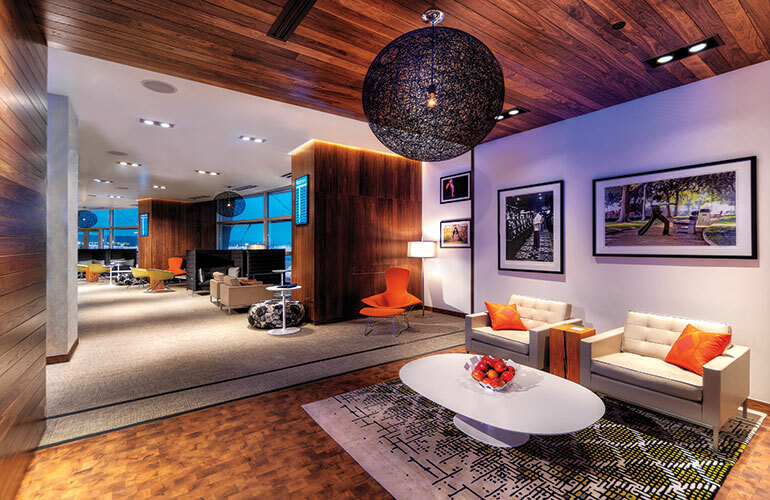 Relax: The Centurion Lounge offers showers, food, drink, Wi-Fi, and a family room to American Express cardholders for $50/day and to AmEx Platinum cardholders for free (Concourse D, opposite Gate D1). No AmEx card? Buy a day pass to The Club at LAS for $35 (Terminal 1, D Gates; Terminal 3, across from Gate E2). Relax some more: There are two XpresSpas here, offering manicures, pedicures, waxing, foot, neck, and back massages—the works (Terminal 1, near Gate D32, and Terminal 3). Gorge: Tom Bradley International Terminal now includes outposts of Top Chef winner Michael Voltaggio’s ink.sack; James Beard Award-winning chef Suzanne Goin’s Larder at Tavern; a Petrossian in case you’re craving caviar, blinis, or any of 20 types of vodka; and an Umami Burger that’s even open for breakfast. Learn: Traveling with kids or model-aircraft nuts? The Flight Path Learning Center is a museum devoted to the history of aviation in SoCal (LAX Imperial Terminal; open Tues-Sat from 10-3; admission free). Chill: There’s an XpresSpa in Terminal 5 as well as in the Tom Bradley International Terminal (between gates 154-156). 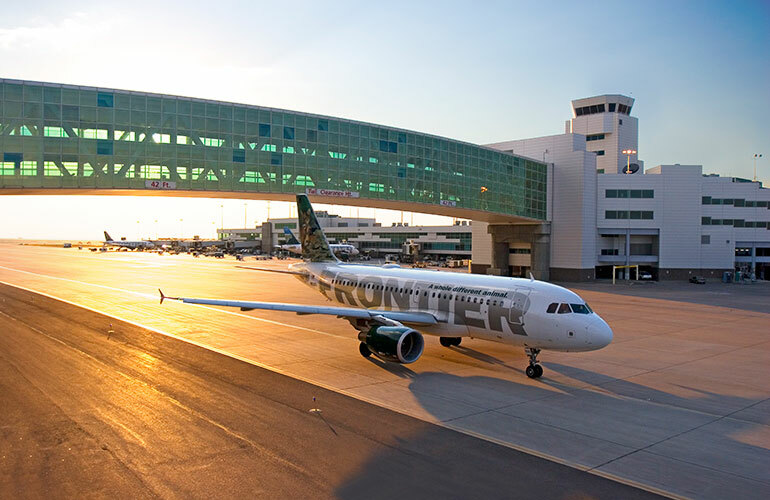 Drink: Grab a mojito with a panoramic view at Top of the Port, the rooftop bar and restaurant at the Miami International Airport Hotel (Terminal E). 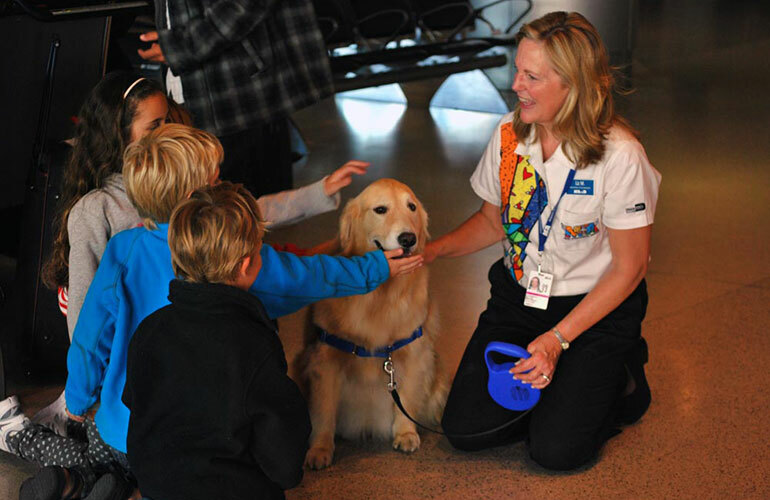 Eat: Versailles, the Little Havana landmark that calls itself “The World’s Most Famous Cuban Restaurant,” has outposts in Terminal D.
Shop: It’s worth a stroll to the colorful Romero Britto concept store in Terminal D.
Snuggle: Casey, the therapy dog, is a trained golden retriever who wanders the airport delivering stress relief and smiles. Golf: A 10-minute cab ride away, the Trump National Doral Miami’s golf course has tee times open to the public. Find elegant last-minute gifts at the Metropolitan Museum of Art Store in Newark Airport. Photo Courtesy Metropolitan Museum of Art. Ride: When my kids were smaller I could entertain them for hours simply riding the AirTrain from terminal to terminal. At sunset on clear nights the ride yields colorful views of the tarmac and the Manhattan skyline; keep your camera ready. Dine: The outposts of two legendary Manhattan eateries, Gallagher’s steak house and the Grand Central Oyster Bar, may lack the ambience of their flagships but serve great grub nonetheless (Terminal C). 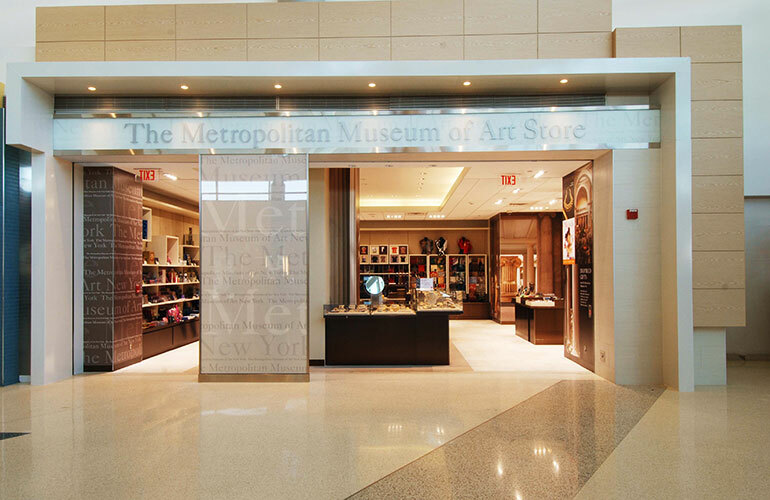 Shop: The Metropolitan Museum of Art Store is the go-to boutique for elegant yet affordable gifts (Terminal C). See: There are serious art exhibitions throughout, as well as an Aviation Museum in the International Terminal dedicated to preserving the history of commercial flight. Meditate: Make the world’s first Yoga Room in an airport your zen zone (Terminal 2). Play: There’s a scavenger-hunt-style self-guided tour for children of all ages. It takes only half an hour, and you even get a prize at the end (Terminal 2). For younger ones, there are three Kids’ Spots for unleashing pent-up energy (Terminal 3, Boarding Area E near Gates 60 and 62; Terminal 3, Boarding Area F near Gate 87A). Eat: My own kids can’t pass through SFO without steering me toward their favorite airport eatery, Fung Lum, for noodles, dim sum, and won ton soup (Terminals 1 and 3 food courts and International Terminal food court). Shop: The Smithsonian Store is like a mini-trip to the various collections that comprise the Smithsonian, including the National Zoo (Terminal B, Gate B37). 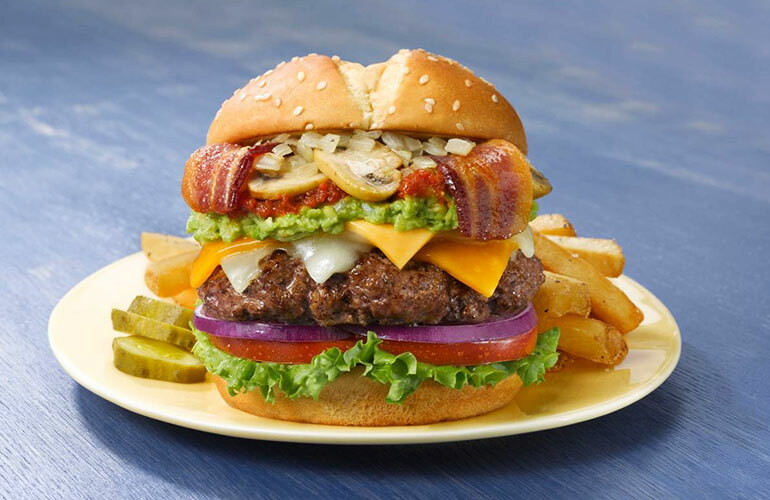 Eat: Max & Erma’s serves up an outrageous selection of gourmet burgers, including the “garbage burger that started it all.” There’s even an All-You-Can-Eat Sundae Bar (B Concourse). Marvel: Just south of the airport sits a massive and thrilling branch of the Smithsonian National Air and Space Museum, the Steven F. Udvar-Hazy Center, where you can easily spend a day ogling everything from vintage aircraft to the Enola Gay to the space shuttle. You can reach the museum in about ten minutes either by cab or by the new direct bus service from the airport which starts July 26 (bus fare $1.75 each way). Forget that ice cream sundae and just go! What’s your favorite U.S. airport find? Share it with us! Be a smarter traveler: Follow Wendy Perrin on Facebook and Twitter @wendyperrin, and sign up for her weekly newsletter to stay in the know. Nothing to do at IAH (Houston)? My favorite restaurant is Bobby Vans, Terminal 8 JFK. The crab cake is divine, I order it every time I fly through! any ideas for an 8 hr layover in Portland, OR? What time of day? Take the MAX downtown to Pioneer Courthouse Square, shops, food carts and a walk along the Willamette River waterfront. I have a 6 +/- 2 hours long layoff there, and I’m worried I might get too bored. At MKE (Milwaukee, WI) there is a really great aviation museum and a huge used bookstore that is the BEST. Both are located in the middle of the airport, not in the “gate” areas. So, you can go there without going through security. Take a 10 minute cab ride to Leelavadee for warm hospitality and a menu of superb Thai massage. Store your bags, get a shower, and enjoy a relaxing cup of tea. Now your refreshed for the long trip across the Pacific. Any thoughts or recommendations on Charlotte? Charlotte has those charming rocking chairs in the atrium if you’re lucky enough to get one! There is a nice bar/restaurant on the corner coming out of Terminal D, which is now called Coca Cola 600 or the Original Rum Bar & Grill next to it before you exit Terminal D. The name has changed since I was last there, but the ambiance and people watching was great (as was the food). Don’t know about these days but it used to be the best one was Pittsburgh. Very friendly Sam Adams Pub and they let smokers smoke so everyone was happy. The Varsity is located on Concourse C at Hartsfield-Jackson Airport (ATL). I had the privilege last week of introducing a young lady from California to a fried peach pie from The Varsity! Last month I was at The Varsity in Concourse F, so I looked into this. Turns out there are two Varsity outposts at ATL: one in C, one in F. Good news for anyone wanting to try fried peach pie! Cafe La Carreta in MIA Terminal E is delicous and one of my favorite airport restaurants (along with Tortas Frontera in ORD). The JetBlue Terminal at JFK is a great terminal with lots of good quality food choices, tons of electrical outlets, free wi-fi, a children’s play area and a pay-per-use lounge. You forgot about the health club and swimming pool on the roof of the Miami airport! I used to love that health club and swimming pool and exercise there in between flights. Unfortunately, they no longer exist! Oh no! That was the best…. Dulles has a Lufthana Senator Lounge. Probably one of the best non-Centurion lounges in the US. Whenever we are stuck in MIA for any length of time (which is a lot as AA frequent fliers) we head to Haggan Daz ice cream in Terminal D…yum! We also like to peruse the Britto gallery store.